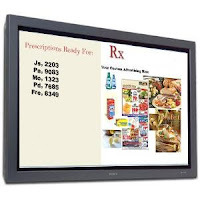 "Visual Pharmacy Plus": KioskRx™ "Will Call and In-Pharmacy Display"
KioskRx™ "Will Call and In-Pharmacy Display"
Abacus’s Will-Call KioskRx™ displays prescriptions ready for pickup. It also displays advertisements. Quickly and easily load ads, pictures, web pages, mp3’s, or videos. 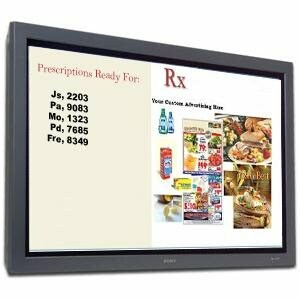 The advanced advertising system can be easily managed on-site or at a single corporate location for multiple sites. 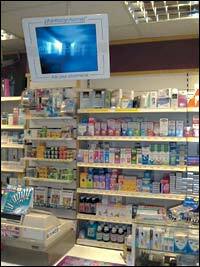 Each display screen can have it's own unique ads running while always displaying the same "Prescriptions Ready" list. 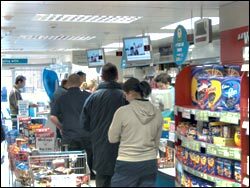 This allows customers to run germane ads in the different departments, for example Personal Care, Beauty, Cosmetics, Vitamins & Supplements, and others within the store. The space or "air time" may also be used to promote store specials or be sold or leased to vendors for promoting new products using existing advertising from TV, web, movie formats, or just images. Generating a new revenue stream will quickly allow the system to pay for itself. With KioskRx™ multiple screens can be strategically placed throughout your store, so that when customers look for their name on the KioskRx™ screen, they are "drawn" to also look at the advertisements, making KioskRx™ a powerful and unique Direct-Marketing tool. KioskRx™ lets customers know when their prescription is ready by simply looking at the monitor. Customers appreciate not having to stand in line wondering if their prescription is ready. Pharmacists will enjoy having fewer unnecessary disruptions in their work-flow. This allows them to spend more quality time with their customers when they need to consult them. The KioskRx™ module is HIPAA compliant and will display information in a variety of effective ways which allows only the specific customers to know who they are and how they are identified on the monitor. KioskRx™ gives customers back their time and also the pharmacist’s and technicians. KioskRx™ Will-Call displays now benefits pharmacies and their customers even more through a built-in feature that sends a text message to the customer’s cell phone, or a pre-recorded voice message to any phone, the second their prescription is scanned into the KioskRx™ Will-Call System! Use this feature to keep prescriptions out of your will-call and into customers hands! Send a "Call us for directions to our pharmacy" message along with your phone number Automatically send pickup reminder messages when prescriptions become aged! Keep your bin management inventory to a minimum! Customers no longer waiting or guessing "when" to pickup prescriptions! No special or expensive hardware needed! 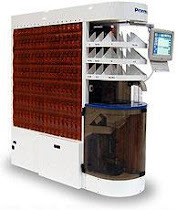 The KioskRx™ Module can be fully integrated with the Visual Pharmacy Plus™ management system. CONTACT US TODAT FOR A LIVE DEMO!